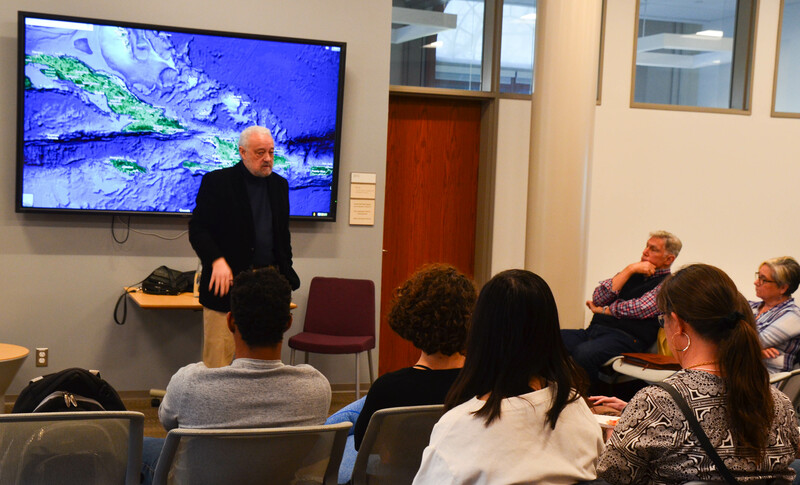 Sociology Professor Emeritus Alex Dupuy held a lecture entitled “Haiti: Migration, and Globalization” in the Fries Center for Global Studies on Thursday, April 12. The event was sponsored by the Allbritton Center for the Study of Public Life and Wesleyan World Wednesdays. Dupuy writes broadly on social, economic, and political developments in Haiti and the Caribbean. He is the author of “Haiti in the New World Order: The Limits of the Democratic Revolution,” “Haiti in the World Economy: Class, Race, and Underdevelopment Since 1700,” “The Prophet and Power: Jean-Bertrand Aristide, the International Community, and Haiti,” “Haiti: From Revolutionary Slaves to Powerless Citizens. Essays on the Politics and Economics of Underdevelopment,” and more than three dozen other articles in professional journals and anthologies. “Haiti: Migration, and Globalization” focused on the political and economic factors—both domestic and global—that transformed Haiti into an exporter of labor to the United States and other countries in the hemisphere in the twentieth century. He started by describing conditions of Haiti during the eighteenth century. With the largest slave population in the Caribbean, the colony of Haiti was a net importer of forced labor. Today, Haiti is a major exporter of labor. As Dupuy described, the United States began to export Haitian labor to the Dominican Republic and Cuba for work on sugar cane fields. “It was one of the first major processes of transforming Haitian labor to working in other places,” Dupuy said. Dupuy also explained how political persecution sparked another wave of migration. Another factor that began to propel not just educated citizens, but also unskilled workers, to emigrate to the U.S. was the establishment of new policies by the International Monetary Fund and other economic institutions. These organizations transformed Haiti into a major producer of exported goods, making it possible for the U.S. to create factories in Haiti and rely on cheap Haitian labor. This created a gradual decline of agriculture that pushed people from the countryside into urban centers to work. However, these urban centers only held about 8 to 10 percent of the population. As a result, Dupuy explained, people began moving to where they have already established contact—places like New York, Miami, and Canada. Food tariffs are a second problem that further contribute to a changing economy in Haiti. When Bill Clinton came into office, Dupuy stated that he placed tariffs on the rice, which made it incredibly expensive to export food. “Haiti is now spending a lot of its resources on having to import food,” Dupuy said. Dupuy then described Haiti’s economic development in relation to other countries experiencing significant economic changes. Dupuy ended the lecture by participating in a Q&A session. Dupuy then advocated for an investment to protect Haitian agriculture, a link between agricultural production and small industries, and to make education more widely available. “So, it sounds as though there’s some possible models here that Haiti could potentially imitate,” a professor remarked during the Q&A.